Mix all ingredients except for baking powder into a blender. Blend on low just until combined. Add baking powder and mix again just until ingredients are well combined. Heat a medium sized skillet on medium low temperature. Spray with cooking oil. Add approximately half the batter to the pan. 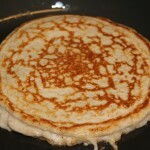 When bubbles start to form and an edge is seen, flip the pancake and cook remaining side.